First adopted on June 12th, 1898, the current version of the flag was reaffirmed on February 12th, 1998- so this flag has been around for awhile. 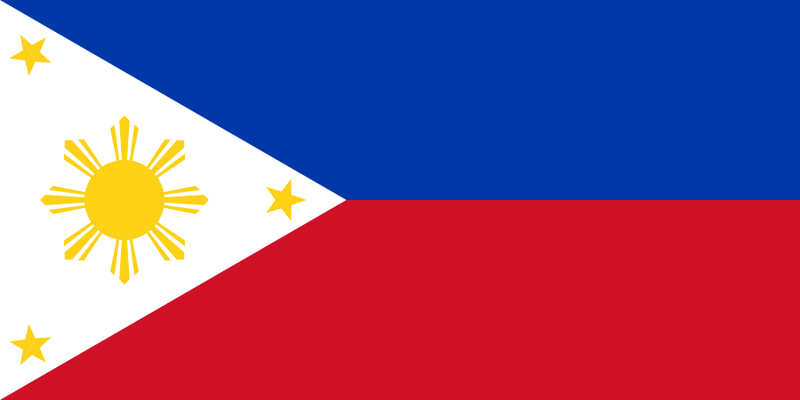 Coolest design feature of this flag: if the Philippines are in a state of war, it's displayed with the red side on top. It's when we get to the stars and the sun that we get into some really hefty detail on the symbolism. The eight-rayed golden sun in the center of the white portion of the flag stands for unity, freedom, people's democracy and sovereignty. Each ray represents a province that had significant involvement in the 1896 Philippine Revolution against Spain- these provinces are: Manila, Bulacan, Cavite, Pampanga, Tarlac, Laguna, Batangas and Nueva Ecija. The five pointed stars in each corner of the triangle stand for the three major islands where the Revolution started- Luzon, Visayas and Mindanao. There's some difference between the current official explanation and the symbolism found in the 1898 Proclamation of Philippine Independence. The white triangle (in this explanation) stands for the Katipunan, a secret society that opposed the Spanish. The red, white and blue are supposedly an homage/thank you to the United States for their help against the Spanish. One of the three stars represents just the island of Panay instead of the entire chain of the Visayan Islands. Just to add to the tally, the sun is supposed to represent the paths the country has made along the path of Progress and Civilization and Bataan takes the place of Tarlac as one of the sun's rays. And that's the flag of the Philippines! Remember, until next time keep your flags flying- FREAK or otherwise!